A short climb and we sit down; Lanjarón‘s white-washed toothy grin looking back at us. Cauliflower clouds block the sun over olive groves like a painter’s watercolour wash. We look as far as we can across the mountains and imagine a man’s last view. Witnessing a death 500 years on. One last stand – and a long way to fall. Today an ugly (but necessary) scaffold supports the ruined walls that surround us. A silent breeze comes through holes in the stones where wood beams once supported floors and ceilings. Those gifted people who see ghosts walking across long-gone floors would have a field day. There’s evidence of a Bronze Age settlement on this hill, and Roman pottery has been found too. Great views abound in Las Alpujarras but this has to be one of the best. Eyes are scrunched to see if the mountain ridge in the distance is the very last that’s there – or whether it’s the heartbeat line of charcoal cloud. You get to the castle from a track off the road that sweeps around the town’s southern edge – or via the curiously-unloved Parque del Salado. One entrance is at the west of town near the Hotel de Lorca. The park is shaded by thousands of trees. One is a graffiti canvas of scratched names, dates, love hearts and faces. Streams appear to bubble like chorizo and paprika stew – it’s as if you’ve stumbled upon a major industrial incident. But it’s the red earth full of iron oxides, minerals and other stuff that makes Lanjarón’s waters so famous. Drench yourself in it and your troubles will be cured, like Trevélez jamón which swing around your head in almost every shop. The PR-A-345 footpath is a circular route of the town, passing through the park (see the yellow/white route marker in the film below). It goes through the town’s old quarter (Barrio Hondillo) and up to the Hermitage – Tajo de la Cruz, a good place to birdwatch. The eastern part of the route takes you along many of Lanjarón’s springs and irrigation channels. And the man whose last glance was the mountains and soon-to-be castle ghosts? 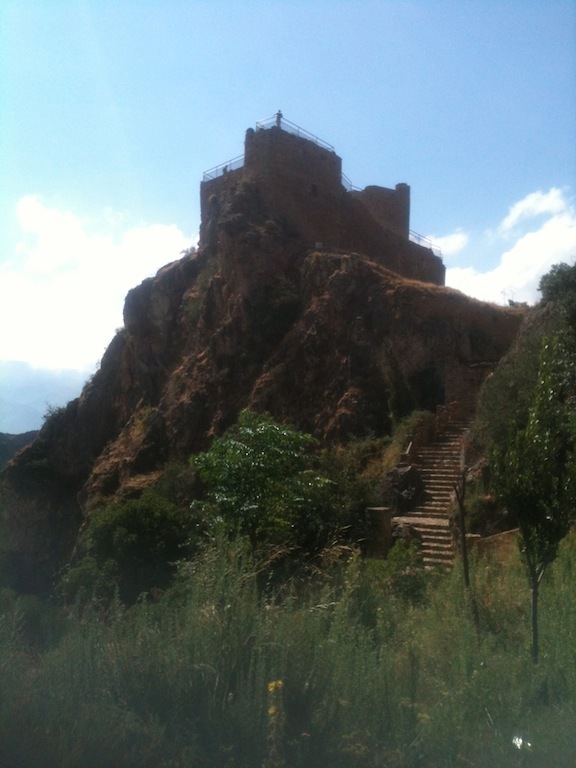 In 1490, two years before the fall of Granada, Catholic King Fernando conquered Lanjarón. The town’s Moorish inhabitants, minding their own business, had to surrender. In 1500, they rebelled (unsuccessfully) and the ‘Black Captain’, who defended the castle, threw himself off the tower rather than surrendering. Fighting in the name of religion always brings out the best in people, doesn’t it? In 1568, after decades of suppression and attempts to convert the Moors to Christianity, they again rebelled. This time, surrounding Christians who had entered a church for shelter, the Moors burned the place to the ground killing all within. Again, the Moors were forced out and a small population of Christians were introduced to the town to share its land. Great – be great to say hi and learn some tips from you!